Pan Ping is from Shanghai, China. She was the first patient to be helped by the Hope For Tomorrow Foundation. 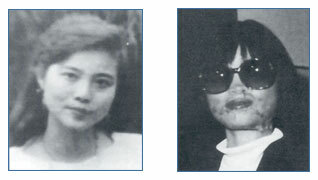 She was disfigured when her boyfriend, in a fit of jealousy, threw sulfuric acid over her face and body. Chinese doctors were able to save her life but unable to save her face. The Hope For Tomorrow Foundation offered its assistance and Pan Ping was able to come to the United States for surgery. The surgery was performed in 1994 by Dr. Jeffrey Meilman at Sisters Hospital of Buffalo, New York. The results were astounding and Pan Ping has a new face and a new life. She was blessed by Pope John Paul II in 1994.